love it!😚😚😁😂😏🙄😎😄😆😃😁😂🏀 so amazing wonderful. Such a creative concept! six minutes is the perfect length for each episode, the arc is still strong with short bursts of content! I listen to this with my 8+10 year old in the car. We are all gripped, and it's not Minecraft/Fortnite related! Eleven-year-old Holiday is pulled from the icy waters of Alaska with no memory of who she is or where she came from. Are her mom and dad really who they say they are? And when she begins to develop incredible abilities, she’ll soon discover she’s not alone in the world. 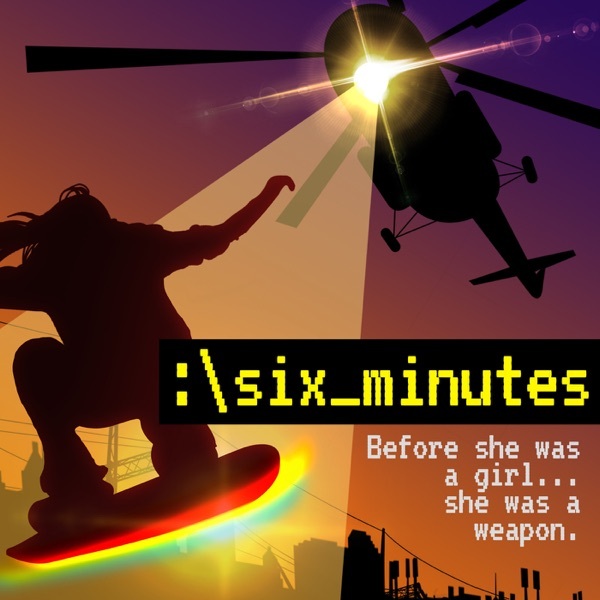 From the award-winning creators of The Unexplainable Disappearance of Mars Patel and The Ghost of Jessica Majors, comes Six Minutes, a new mystery adventure for the whole family. Starting on March 1st, new six minute episodes, twice a week, all year long…and beyond. With Cyrus and Brynleigh being held hostage by Magnus, Holiday and Birdie plan a rescue, unaware that they’re not the only ones headed into the swamp. Cyrus and Brynleigh’s rescue takes them out of the frying pan and into the fire – literally. As the Anders family prepares for Christmas, Cyrus and Brynleigh plan a break-in at City Hall. Holiday finally hears the story of where she came from, but can she trust it? Dr. Whittier shares the wonders of Thornton Rust, and the secrets of Holiday’s past. Holiday meets someone who has a very personal connection to her. Holiday and her family uncover deep secrets behind the walls of Thornton Rust. The Anders family arrives at a creepy old mansion outside New Orleans…a mansion that just might contain the ghosts of Holiday’s past. When Cyrus discovers how WhittierCorp is tracking his family, Badger finds himself on the hot seat. The celebration of Brynleigh and Birdie’s birthdays takes a dark turn. Birdie puts the family in jeopardy when she turns to the wrong person for help. A voice from the past reaches out to Cyrus. When Cyrus’s secret is exposed the Anders family scrambles to do damage control. Brynleigh helps Holiday test out one of her abilities…and learns the truth behind her new power. Birdie and Badger go snooping in Cyrus’s stuff…and find something shocking. When the Anders family has to run yet again, Cyrus’s dark secret is on the verge of being discovered. Birdie and Brynleigh’s visit to the motel pool is ruined by univited visitors. Life on the run takes the Anders family to Oklahoma where one of them is keeping a big secret. When her family is trapped, Holiday resorts to drastic measures to escape. Brynleigh and the Anders family pull off a Southern fried scam, while something Badger triggers another stunning memory for Holiday. Over a month after their daring escape from Alaska, Holiday and the Anders family take on new roles to trick an old nemesis. Meanwhile, two mysterious young strangers are hot on their trail. We’re taking a week off in preparation for season 2 of Six Minutes. As a treat, here’s part 2 a sample of a much longer interview you can hear over at our Patreon page. We’re taking a week off in preparation for season 2 of Six Minutes. As a treat, here’s part 1 a sample of a much longer interview you can hear over at our Patreon page. In the thrilling climax of our first hundred episodes, lives are changed forever during an epic showdown between the Anders family and WhittierCorp. The Anders family fights to stay together in the face of Whittier’s attacks. Monica defends her children against the Monarch. Holiday makes a daring rescue, but the danger is just staring for the Anders family. Battle lines are drawn as WhittierCorp comes for Holiday and her family. The Anders family prepares to make a run for it. But can they get away before WhittierCorp shows up at their house? Cyrus comes face to face with Angelica Graves, who has plenty to say about Holiday’s history. In a game-changing moment, Holiday remembers a pivotal moment from her past. With the Childcatchers closing in, Cyrus takes a leap of faith. Cyrus finds himself trapped with time running out to save Holiday. Things go from worse to worst inside Whittier and Cyrus is forced to take matters into his own hands. Holiday and Cyrus hack into Whittier’s database where they discover something shocking about Holiday’s past. Holiday and Cyrus search for Casey as the evil Magnus searches for them. Cyrus sneaks Holiday into WhittierCorp, where she gets a window into what her previous life may have been. As Holiday prepares to go inside Whittier, she says goodbye to the family she has come to love so much. Cyrus is busted by Dr. Zaslow, and his chance to help Holiday might be fading. But Casey’s fate could be even worse. Brynleigh uses her newfound power over Holiday. Holiday and Cyrus make plans to break into Whittier, but all bets are off when Cyrus is grabbed from school. While trying to acclimate to her new roommate, Holiday gets an unsettling message from a mysterious source. In the aftermath of the confrontation in the woods, the Anders family finds themselves with a house that’s getting more crowded by the minute. Holiday, Brynleigh and Badger make it to safety, but Magnus makes them pay for it. Meanwhile, inside WhittierCorp, Cyrus might have been outed as a spy. Badger tests out his powers as Holiday and Brynleigh ride tandem on the hoverboard. Holiday, Brynleigh and Badger concoct a plan to escape from the WhittierCorp Childcatchers. Brynleigh reacts to Holiday’s shocking revelation. Cyrus and Casey attempt to save them from Magnus and his team. Trapped in the woods with Brynleigh, Holiday finally has no choice but to tell her EVERYTHING. Badger goes running into the woods and it’s up to Holiday and Brynleigh to find him… before the Childcatchers do. Holiday and the Anders family visits the Pasternack cabin as a snow storm looms on the horizon. Holiday and her dad attempt to find out who sent the mysterious video and whether they are a friend…or another threat. A package arrives at the Anders’ house with shocking footage revealing that someone else out there is watching Holiday. Casey reveals her special powers to Cyrus. Cyrus escapes disaster in the lab, but Holiday has it even worse when Brynleigh shows up at the Anders’ house. Cyrus gets his big break in Whittier Labs, but are his dreams about to be blown sky high? Brynleigh foils Holiday’s big scheme, but Birdie saves the day with a surprise invitation. Holiday and Birdie execute a bold plan to bring back Badger’s memory. Cyrus gets his assignment at Whittier Labs and it’s worse than he could’ve ever imagined. Cyrus enters WhittierCorp and meets his supervisor, Magnus, who is anything but friendly. Birdie tries to bond with the new kid in class. Cyrus prepares for the first day of his internship inside Whittier Labs. Holiday finds herself in another mess with her archrival. But this time, Brynleigh has something Holiday needs. Birdie tracks down Badger in the last place she’d ever expect. The return of Badger goes a lot differently than Birdie expected. Birdie narrates the story of her life…and an old friend makes a shocking return. Holiday’s medical crisis lasts exactly…six minutes. Holiday’s discovery that Cyrus kept a secret from her takes a very scary turn. Holiday gets a scary glimpse at what her life could have been at WhittierCorp. The announcement of the science competition winner makes life a lot more complicated for the Anders family. When Hovie doesn’t come to Holiday’s rescue on the roof, she takes the hard way down. Holiday and Birdie’s plan to save Cyrus backfires when Holiday finds herself trapped on the roof. The Anders family accompanies Cyrus to Anchorage for the big science competition. However, they quickly learn that they’ve been followed here by some people with bad intentions. The dinner party falls apart, but Holiday gets a glimpse into the life she used to have. Cyrus hatches a plan to win the science competition. As a special thank-you to Six Minutes listeners, the guys at Gen-Z Media are giving you a sneak-peak of our new show, Becoming Mother Nature. It launches September 14th, so if you enjoy what you hear, please search Becoming Mother Nature on your podcast app, and head over to subscribe. The show will release every Friday, and when you subscribe, we’ll let you know every time a new episode becomes available. The Anders family hosts a dinner for a guest who could bring their world crashing to the ground. Holiday’s showdown in the girls’ room leads to a very surprising invitation. As Cyrus prepares to go into the belly of the beast, Holiday finds herself face to face with a new nemesis. Cyrus takes a big risk to keep his family safe. The Anders family scrambles to pick up the pieces and protect themselves from Flashcard and Whittier. In the aftermath of Flashcard ‘s outing, the Anders family is exposed. Flashcard, the Whittier spy, is finally uncovered! Holiday finds herself trapped with Brynleigh as the Childcatchers close in on the truth about her identity. Holiday’s plan to trap Flashcard turns dangerous when the Childcatchers show up at the concert. Holiday frees the hoverboard as she and Cyrus make a plan to trap Flashcard. The Anders family fears they may have outed themselves to Flashcard, and Holiday reaches out to an old friend for help. When Whittier helicopters hover above the school, Holiday, Cyrus and Birdie take action. Cyrus and Casey bring their science project to life, but things don’t go as planned. Holiday and Cyrus discover someone snooping around. Will the hoverboard be discovered? Brynleigh gets closer to the truth about Holiday…and that’s even worse than it sounds. When Holiday and Cyrus are busted breaking into Brynleigh’s house, an unexpected ally comes to the rescue. Holiday and Cyrus sneak into Brynleigh’s house...but they’renot alone. Holiday gets closer to the truth about the spy in her school. A nosy reporter comes to the Anders house, and Holiday’s secret is in danger of being exposed. Birdie’s accident on the playground leads to a shocking discovery about the school. Holiday’s powers grow, but Cyrus makes a decision that might put the family in jeopardy. Holiday displays more amazing abilities and Cyrus puts them to the test. Cyrus’s attempt to be normal hits a snag when he’s called into the principal’s office and given a big surprise. Holiday heads back to school and attempts to be a normal kid. But when a new unexpected ability emerges, she once again proves to be anything but normal. With Birdie hanging on for dear life, it’s up to Holiday and her trusty hoverboard to save the day. The search for Badger puts Birdie in terrible danger. As a special thank-you to Six Minutes listeners, the guys at Gen-Z Media are giving you a sneak-peak of our new show, The Young Ben Franklin. It launches, when else, July 4th, so if you enjoy what you hear, please search Young Ben Franklin on your podcast app, and head over to subscribe. The show will release every week throughout the summer, and when you subscribe, we’ll let you know every time a new episode becomes available. The Anders family follows clues that may lead them to Badger, and to the truth about Holiday’s past. Holiday’s principal shows up at the Anders house and threatens to expose all their secrets. Follow the mystery all year long..six minutes at a time. The Mayan Crystal, a wondrous adventure filled with talking animals and ancient gods. Or Young Ben Franklin, launching on July 4th, which finds everyone’s favorite founding father as a rebellious 14-year-old matching wits with the evil governor of Massachusetts. You can even hitch a ride on our kids-in-space epic, The Alien Adventures of Finn Caspian. And catch up on the latest episode of the delightful science podcast, **Tumble. And don’t forget to play along with the brilliantly stupendous weekly game show, Pants on Fire, in which kids try to decide which adult is a real expert and which is a liar, liar, pants on Fire. Join Deborah Goldstein and her hilarious co-host, L.I.S.A. the robot, as we see just how good human children are at spotting the fakes. We have an entire summer of fun stuff planned with new shows, social media takeovers by your favorite characters and by YOU the listeners. And we’d love to see your family road trip photos! When you hit the pavement and turn on a Gen-Z show, tweet us @genzshows and use the hashtag #SummerRoadTrip. Thanks so much for listening, and we’re looking forward to hitting the road with you! When Holiday goes missing, the Anders family must work together to find her. Follow the mystery all year long..six minutes at a time. Holiday must choose between staying with her family or pursuing the life she can’t remember. Follow the mystery all year long..six minutes at a time. Holiday and her family hide out on the army base, but are they safe there? Follow the mystery all year long..six minutes at a time. As the childcatchers close in, Holiday has to decide whom she can trust. Follow the mystery all year long..six minutes at a time. Holiday and Cyrus make a daring escape, but the Childcatchers are closing in. Holiday and Cyrus go back to where the story began, to the boat where he spotted Holiday floating in the water. When Holiday and Cyrus get too close to the truth, their mom and dad take drastic steps. Locked in her mom’s car, Holiday finally gets answers about her past, but are they real ones? The mysterious discovery in Monica’s office makes Holiday decide she wants answers – NOW! Holiday, Cyrus and Birdie rush to their mother’s office for help, but they stumble upon yet another mystery. When Holiday is nearly caught sneaking into the military base, her trusty hoverboard comes to the rescue. Holiday, Cyrus and Birdie make a decision to ask for help from an adult, but can they trust this person? Holiday and Cyrus attempt to look for answers at the military base, but when they get into trouble, a surprising friend comes to the rescue. After Badger’s capture, Holiday, Cyrus and Birdie begin to suspect their parents are not who they say they are. Follow the mystery all year long..six minutes at a time. A mysterious organization comes for Badger and Holiday realizes she could be great danger. Follow the mystery all year long..six minutes at a time. When Mom and Dad take the kids on a surprise camping trip, Holiday sneaks away to get answers from Badger. Follow the mystery all year long..six minutes at a time. Holiday faces off with her rival Brynleigh and discovers another ability she never knew she had. Follow the mystery all year long..six minutes at a time. Holiday and Cyrus work together to find the mysterious Badger, who may hold the key to unlocking her past. Follow the mystery all year long..six minutes at a time. A strange encounter with their mom and dad makes Holiday and Cyrus wonder what their parents are hiding. Follow the mystery all year long..six minutes at a time. Holiday corners Cyrus with questions about her past. Follow the mystery all year long..six minutes at a time. Holiday’s first day at school leads her to question whether she can trust her own family. Follow the mystery all year long..six minutes at a time. Holiday goes to school for the first time, but she’ll soon learn she’s not like other kids. Follow the mystery all year long..six minutes at a time. Holiday’s hoverboard leads her to Badger, who has a shocking message about her past. Follow the mystery all year long..six minutes at a time. On her birthday, Holiday receives a gift that unlocks an amazing ability she never knew she had. Follow the mystery all year long..six minutes at a time. Holiday is visited by a mysterious boy who knows something about who she is and where she came from. Follow the mystery all year long..six minutes at a time. The Anders family goes on a whale watching trip and finds something miraculous floating in the water. Follow the mystery all year long..six minutes at a time. Eleven-year-old Holiday is pulled from the icy waters of Alaska with no memory of who she is or where she came from. Are her mom and dad really who they say they are? And when she begins to develop incredible abilities, she’ll soon discover she’s not alone in the world. The big mysteries unfold in six-minute episodes, twice each week, all year long.